It has been a long time coming but the Supra is finally returning to the Toyota lineup. After a 20 year hiatus, this iconic Toyota sports car will soon be available to purchase at Toyota dealers across the nation. 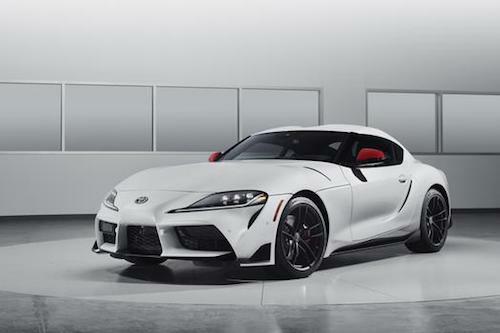 To celebrate the return of the Toyota Supra, special Launch Edition models will be available before standard 2020 Toyota Supra models roll off the assembly line. Only 1,500 production Supras for the U.S. will be Launch Edition models, all of which will feature an individually numbered carbon-fiber badge on the passenger-side dashboard complete with a graphic of Toyota Motor Corporation President and Master Driver Akio Toyoda’s signature. New Toyota Launch Edition Supra’s will be available in Absolute Zero White and Nocturnal Black exterior finishes with sporty red interiors. Racing-inspired seats, wrapped in red leather, with red leather steering wheel grips, and a red center console with carbon-fiber accents will further differentiate new specialty Supra Launch models from others in the lineup. Standard 2020 Toyota Supra models will be available with a choice of two grades: 3.0 and 3.0 Premium. Both models will be powered by a 3.0-liter turbocharged inline six-cylinder engine that produces 335 hp and 365 lb-ft of torque and is mated to an 8-speed automatic transmission with racing-style paddle shifters. Driver friendly features on the new Toyota Supra include either 6.5 or 8.8 inch display screens with Bluetooth and iPod capability as well as available navigation, Apple CarPlay, 12-speaker JBL audio system, wireless phone charging, color Head-Up Display and heated, leather-trimmed seats. New Toyota Supra models are expected to arrive a dealerships this summer. If you would like to learn more about this exciting new Toyota sports coupe please contact our Rochester Toyota Dealership.